All horses should have regular dental exams and most require tooth rasping each year. This is essential to remove any sharp edges, which lead to painful cheek ulceration, as well as keeping all teeth in balance to maintain efficient chewing. Regular dentist teeth checks are extremely important for dental health, and this applies as much to your horse as it does to you. Dental pain is a frequent cause of poor performance, weight loss and grumpy behavior, and untreated dental disease can lead to far more serious problems! Horses are well adapted not to show dental pain, meaning severe tooth problems can sometimes go unnoticed unless a thorough examination is performed. Working with horses across Surrey, Hampshire and Sussex, the veterinary surgeons at the Blackdown Equine Clinic have extensive equine dentistry training, skills and experience, and are committed to making the 'dentistry experience' stress free for your horse. Being fully qualified equine vets allows us to legally perform all procedures categorised by the British Equine Veterinary Association (BEVA) and British Association of Equine Dental Technicians (BAEDT) including removing Wolf Teeth, and the administration of pain relief and sedation. Similar to people requiring trips to the dentist, regular dentistry check-ups are extremely important for maintaining good equine dental health. In addition to providing an equine dentistry service, the dedicated veterinary surgeons at the Blackdown Equine Clinic are uniquely able to provide complete health care for your horse. We are conveniently able to undertake remedial dental work at the same time as your horses’ annual vaccinations and health check (prior booking required), saving you both time and expense. 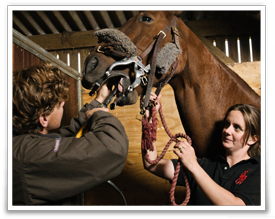 Most equine dentistry can be performed in your horse's stable and we treat horses across Surrey, Hampshire, East Sussex and West Sussex. We also believe that seeing your horse whilst it is well helps in diagnosing problems should they become unwell. Blackdown Equine Clinic vets provide a fully mobile service for routine horse dentistry, covering Surrey, Hampshire, Berkshire, East Sussex and West Sussex. Our experienced equine vets all carry portable digital X-ray equipment alongside our usual range of dental tools, and can legally provide pain-free removal of wolf teeth and cheek teeth when appropriate. If further remedial dentistry is required in complex cases we are also able to offer referral to local specialists. Sometimes sedation will be required to allow us to safely and proficiently rasp your horses’ teeth. Whilst this may seem excessive, it is vital that we are able to work accurately in the tight corners of your horses’ mouth without causing any undue stress. Unfortunately some horses just don’t like having their teeth rasped, but we will work as hard as possible to make it a stress-free experience! It is also vital that any painful procedures, such as wolf tooth extractions, are carried out under sedation. Whether a performance horse or a much loved equine companion, all members of the equine family will benefit from a routine dentistry check or rasp. This benefits your horse in the short term with both eating and accepting the bit but also in the long term by preventing more serious dental issues. Our vets are experienced in all aspects of equine dentistry and we offer a range of services from routine dental care to advanced procedures such as extractions. Dental health is vital to all horses regardless of age, whether for performance or pleasure; as such our vets take dental health very seriously and aim to provide a full and comprehensive dental service.